I've been working on a container garden including herbs. So far, my basil is my biggest herb success. I moved most of my herbs to my courtyard because I needed more plants there. However, my courtyard is mostly shaded. I know herbs need a lot of sun, so I keep watching where the sun is coming in and I keep moving the herbs. My basil plant is doing so well probably because it's still on my porch which gets a lot of sun. I wonder if I'll give in and move all the herbs to the porch...I'm pretty determined to keep the majority of them in the courtyard, so we'll see. If you feel you have any advice on growing herbs, please share it! And this is after I stole a large stem for propagation! Wash (under cool water) and dry the tomato and pat dry the basil leaves. Slice the tomato and the cheese into approx. 1/4" slices. Stack or overlap (repeating until one tomato is used) in this order: one tomato slice--add salt & pepper, cheese, basil leaf. * End with a tomato slice and, if you like, a basil leaf. Lightly sprinkle the vinegar over the salad. Garnish the plate with a basil leaf. While I was photographing the stacked salad in my courtyard, a big bolt of lightning frightened me! The layered salad was photographed inside! Even Easier and Also Impressive Layered! Great, a dish you can enjoy with no guilt! 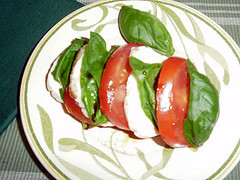 What a delicious summer recipe...and how wonderful that you can use your own basil! Nothing is better. Thank you for sharing such an inspiring recipe. I want to get into my kitchen now. I hope you are having a beautiful and bountiful Monday! @Monet - So good to hear from you! The basil truly makes this recipe! I'm very excited about my herbs. I've never really had time to try to garden. I think I've got the sunlight thing down--I'm working on the watering part! Have a great week! This looks delicious and healthy! I can't wait for tomatoes to appear in our farmers' market. My basil is doing well. I see pesto for the freezer soon. @From the Kitchen - Well hello Bonnie! I hope to see my brother show up soon with some homegrown tomatoes! I need your recipe for homemade pesto...I didn't know it was a freezer candidate. 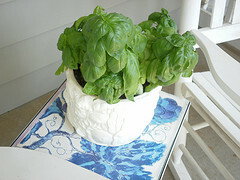 Basil seems to be the easiest herb I've tried so far to grow in my container garden. 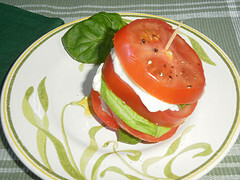 Yes, please try the stacked Caprese salad recipe...it is delicious! I love your daughter's version of caprese salad! And your basil is gorgeous! @Dulce Dough - Thanks Jill! It's so easy and refreshing! Have a great Father's Day weekend!